I get tired of the games vs. story argument. Not to mention the entertainment vs. practical utility argument. In many cases these discussions come from assumptions that are wrong, and the problem is that if you get caught up in them, they can limit your options to making great experiences. Even some very smart experts have contributed to the confusion. “Video Games Are Better Without Stories” says Ian Blogost in a recent article in the Atlantic. While Robert Marks tells us that “Video Games Aren’t Just Better With Stories, They Are Stories” in another recent article at CG Magazine. I would say yes, video games are sometimes better without stories, and yes, some video games are stories. Neither statement is always true or false. I think the discussion gets muddled from two erroneous assumptions: first, that games are a medium, and two, that storytelling is the primary goal of a medium. Let me elaborate. 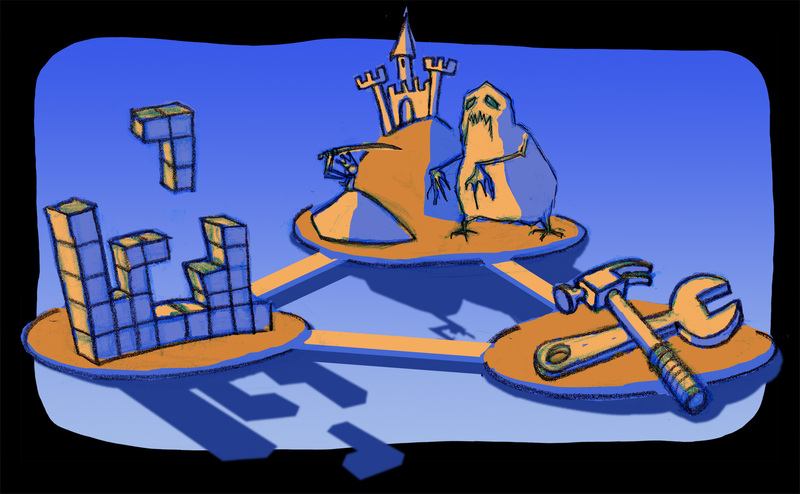 Games are not a medium, just the same way stories are not a medium; they are both the product of our need to understand and assimilate our experience of reality. Neither of them is a medium, but you can make both stories and games using almost any medium. The written word is a medium, painting is a medium, film is a medium. I’d like to avoid getting into philosophical definitions of what is a medium here but think of writing: the written word is a medium, a means to communicate stuff. As any other medium it can be used in different ways: to tell stories, to create games, or to solve other practical problems that have little to do with either of them. You can use the written word to make games like you do in cross-puzzles, tell stories like you do in a novel, or solve a practical problem like we do when we write a list to remember what to buy at the supermarket. You can do the same with other media: you can use still pictures to create hidden object games like in “I Spy” books, tell stories like in a movie poster, or solve a practical problem like when you get a photo ID to prove your identity. So what are games and stories exactly? Why have they been an important part of every culture around the world? If you think about it they are both tools that help us get better at living and dealing with the reality around us. In real life we like to accomplish things, and games let us practice coming up with good strategies to accomplish goals. In real life we also need to make sense of what happens to us, and stories help us do that. Both games and stories help us get better at living and understanding our lives. Games are formal systems with clearly defined goals and rules. In a way they are a simplification of reality. In real life we have goals that we want to achieve, and to do that we need figure out what are the best strategies to achieve them. Figuring out the right strategies includes finding out what are the best paths to achieve our goals, what resources do we need, how to get those resources, and how to best manage them. In most cases, there are also general rules we can follow to increase our chance of reaching our objectives: if you complete your assignments you have a higher chance to pass your class, if you have experience working at a game company you have a higher chance to get hired at another game company. Games are similar to life but simpler. While in games all the goals and rules are very clear, reality is a lot fuzzier: goals vary from situation to situation, and rules are in most cases only guidelines that don’t assure anything and tend to change over time. In a way, games let us take a stab at aspects of life in simpler and safer settings. They let us experience aspects of reality, and they give us the opportunity to explore and figure out the best ways to reach goals. Games are great because they give us agency and let us practice how to better use it to accomplish specific things. Stories are also simplifications, but they focus in structuring our experience of reality to provide meaning. They don’t focus on letting us try different ways of achieving a goal, but rather on helping us understand our experiences and make them meaningful. When we tell a story we organize our actions and the events around us in ways that make it all more intelligible, in ways that make sense. In a traditional story there is always some sort of conflict that gets resolved somehow at the end: There is a beginning, where a protagonist wants something but finds one or more antagonists or obstacles that don’t let him get it; there is a middle, where the protagonist tries different ways to overcome the obstacles and reach his/her goals; and there is an end or resolution where he/she succeeds or fails in achieving his /her goals. Stories help us understand life experiences better in terms of conflict and resolution. Stories are compelling not because they let us take a stab at dealing with reality, but because they let us make sense of it. The core value of a story is in creating meaning out of otherwise chaotic random events. If we wanted to talk about games as a medium I would say that rather than videogames being a medium, computer applications are the medium, and you can use computer applications to make games, tell stories, or solve problems. Or a combination of all three. Most modern videogames contain both game systems, and elements of storytelling. Other applications like CodeSpark Academy -a game for mobile devices with a lot of storytelling elements that aims at teaching kids the principles of computer science in a fun way- even include elements of all three: games, storytelling, and solving a real need. I think it is much more useful to think of applications for different media in terms of experiences, not games or stories. Think of real life experiences. Some experiences are great because of agency, because we did it. Do you remember the first time you rode your bike without training wheels, or the first time you climbed a very tall mountain? What makes these experiences great is that we did them ourselves. Many people had done the same thing before, but they are still great because this time we were the ones who did them. Other experiences are great because of the story or meaning behind it, like when the first person in your family graduates from college. That can be a great experience because of what it means for you and your family, even if you were not the one who did it. Other experiences are great because they solve a practical problem, like finding a good car mechanic that fixes your car at a reasonable price. But agency, meaning, and practical utility are not mutually exclusive. The experience of climbing a tall mountain would be even more memorable if there is more meaning or a story behind it, like if you suffered from a physical ailment since you were a kid and were nonetheless able to overcome it and climb after years of preparation and struggle. Fixing your car (practical utility) would be more memorable if you are the one who did it (agency), and even more if the car was your grandfather’s car that is full or childhood memories (meaning). The same goes with computer applications, from videogames to VR and AR applications. Being able to use your agency to overcome interesting challenges does not exclude the possibility of making those challenges more meaningful, or useful. Mixing game and story to add both meaning and agency can make the experience much more memorable. Just as adding practical utility could. Games, stories, and practical utility are not exclusive. It is not easy to combine these three aspects in a compelling meaningful way -just as in real life experiences- but following the right process makes it much easier. When you set the right clear goals, use the right ingredients, and use an iterative process with the right prototypes, making rich powerful experiences becomes easier. You can see more information on how to do that in the articles from this same site that I just linked to in the previous paragraph. I would love to hear your thoughts and comments about the intersection of game mechanics, storytelling, and utility. 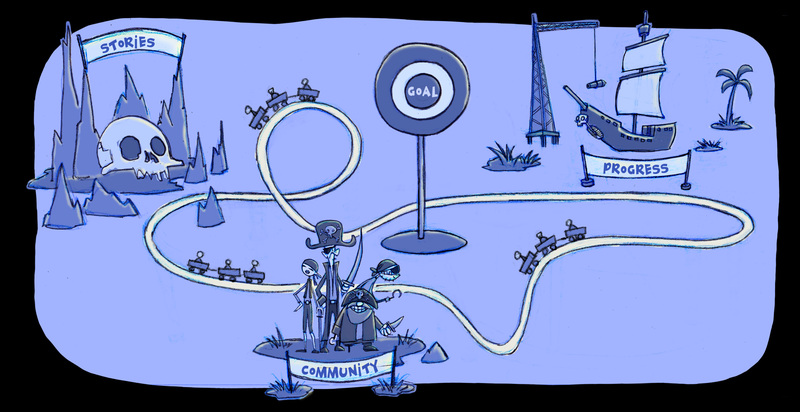 Community Can Help You Build a Killer App . . .
“The best content is other people” says Dmitri Williams in a recent op-ed article in the L.A. times, making a very good case about the importance of the social aspect in helping new games and platforms succeed. But for social features to work, they need to happen at the right time and place in your experience. The most successful games of the last few years have all helped us connect socially: “World of Warcraft,” “League of Legends,” “Pokémon Go”. Creating a community not only brings new content but let’s you grow your game or platform organically; a vibrant community is a very strong attractor of new players. This is why it is so important for games and new platforms like Virtual Reality to figure out how to add social components. “Virtual Reality needs to be social to succeed,” also argues Signe Brewster in another great article making the case for social, but the importance of forming a community is not limited to VR: it is an essential ingredient to any game and app that is trying to engage people in the long-term. We are social animals. We like to feel connected to other people and feel part of something larger. The trick is that the features that will help you build a community need to come at the right time and place. Otherwise they won’t work. A very common mistake that I see many developers make is underestimating the cost of social features. I am not talking about production and implementation costs, although that could also be expensive, but high costs from the player’s perspective: our social status is precious and we are very protective of it. Many games ask us to invite friends and post about the game in our social networks as soon as we finish a couple of levels. Do you do it? I doubt you do. I don’t. The reason is because social interaction is expensive. Our social standing among our friends and family is precious; we are not willing to mess with it easily; even less for something that we don’t care much about. Most players are only willing to share things that they are committed to and believe will help their social status. They won’t share just because it is easy to do, or by giving them a cheap incentive. In a way we deal with these things in a similar way we deal with other things in life. We would not introduce a person we just met at a bar the night before to all our friends and family in Facebook, even if we had a good time at the bar. The same goes with your game, not many are willing to share after the first few sessions; you are better off focusing first on creating an experience that players will find worth sharing, and leaving the social aspect for later in the game experience. Once you are deeply invested in an experience you are much more willing to try to bring your friends along. The same thing happens with multiplayer games like MMOs. Even if it is not about bringing external friends but about meeting players and making friends inside the game, most people rather play alone until they have mastered the basics of the game. Most people don’t want to appear as incompetent, even in front of strangers. So here too, you don’t want to introduce social features and social pressure too soon. This will also be the case for any social VR apps out there. Social is powerful, but to really thrive people need to feel safe. Social mechanics work better when you are already familiar with a space and its rules, when you already feel competent and confident. This is what successful MMOs do well. When we designed Disney’s Toontown Online, we pushed players to make friends with other players in specific missions, but those missions were only available after you were familiar with the world, and they provided very clear objectives that worked as ice-breakers. The reason it was easy to make friends and form a larger community is because you had a clear excuse -a mandate to connect- and the connection benefitted you and your new friends and made everybody more successful in the game. In a previous article, The 4 Steps of Successful Games and VR Experiences, I talked about the steps of long-term engagement: stand out-connect-engage-grow. First you need to stand out in the crowd of games and apps; then you need to connect emotionally to the players so they are willing to give your game a chance; then you need to find ways to keep them engaged; and only then you can bring the social aspect to help grow your product. Even in the case of MMOs where social interaction is key, it is better to limit and scaffold around the social aspects until your player feels like she has mastered the game enough to have a good social standing. Is the player already engaged? Make sure that the metrics you are using to determine that your player is engaged make sense -finishing one level of your game does not mean the player is engaged. Does the player feel confident about the rules of the game and his/her role in it? Will socializing help her strengthen her social standing? If not, how can you scaffold your game’s social interactions so they feel safer and risk-free? 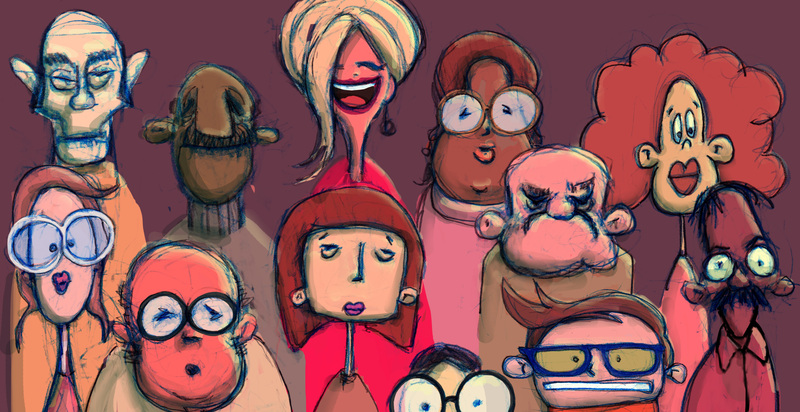 Social features are very powerful, but they are also precious for most people. Adding social features too soon can backfire. Most players need to be fully engaged and feel comfortable before they are willing to interact with strangers or they are willing to bring their friends over to a new experience. I strongly believe that if you want to engage players in the long-term it is crucial that you include some community building features; but make sure you engage and make your player feel comfortable first. How can you make your game more engaging and effective? 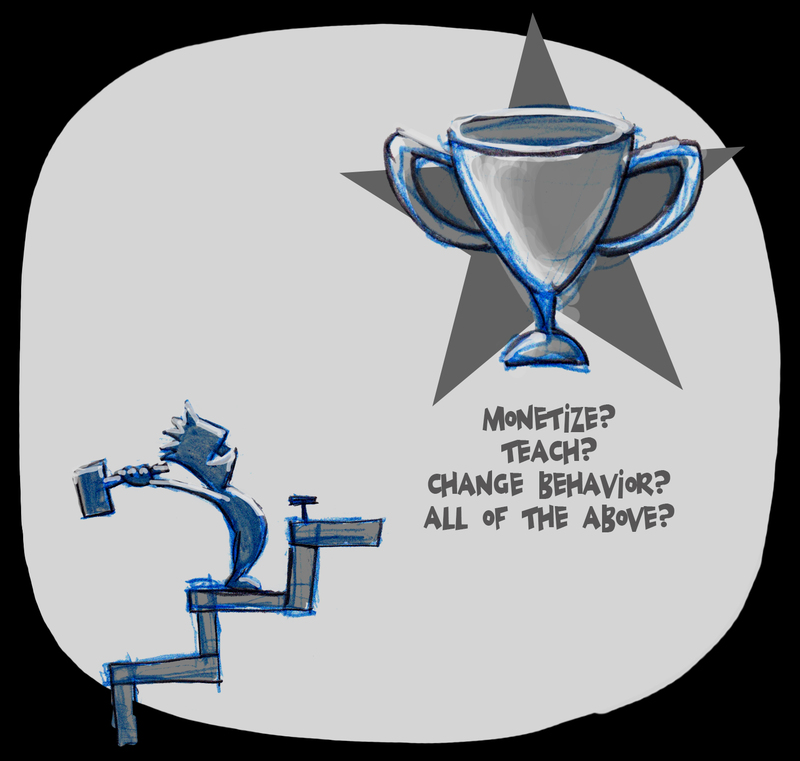 In a nutshell, by making engagement stronger at the different levels of the experience and by making engagement connect to your ultimate goals: monetizing, teaching, or changing behavior. There are 3 questions that can help you figure out how to best do that and they can be applied not only to games, but also to education, VR experiences, and other software that needs to engage users. Let me elaborate. I talked in a previous article how successful games and experiences need to first stand out so your target players notice you, then connect with them at an emotional level so they are willing to give you a few minutes of attention, then engage them so you can keep them for longer time, and finally get them to help you grow by sticking around and inviting their friends to join in (more about this process in this article here). To do that, games can use different ingredients like compelling art, fun game mechanics, resonating themes, etc. Some ingredients like art are better at helping you stand out, some others like mechanics are better at keeping engagement going (more about the ingredients in this article here). The challenge is how to mix and tie these ingredients together to take players to full-long-term engagement. Game design is an art and a craft that can take years to master, so I don’t want to oversimplify the art of engagement, however I find that the following 3 questions can often bring good clues about what is missing and possible solutions to make the game more successful at reaching the goals we want. Question 1: Do You Have a Compelling Core Loop? 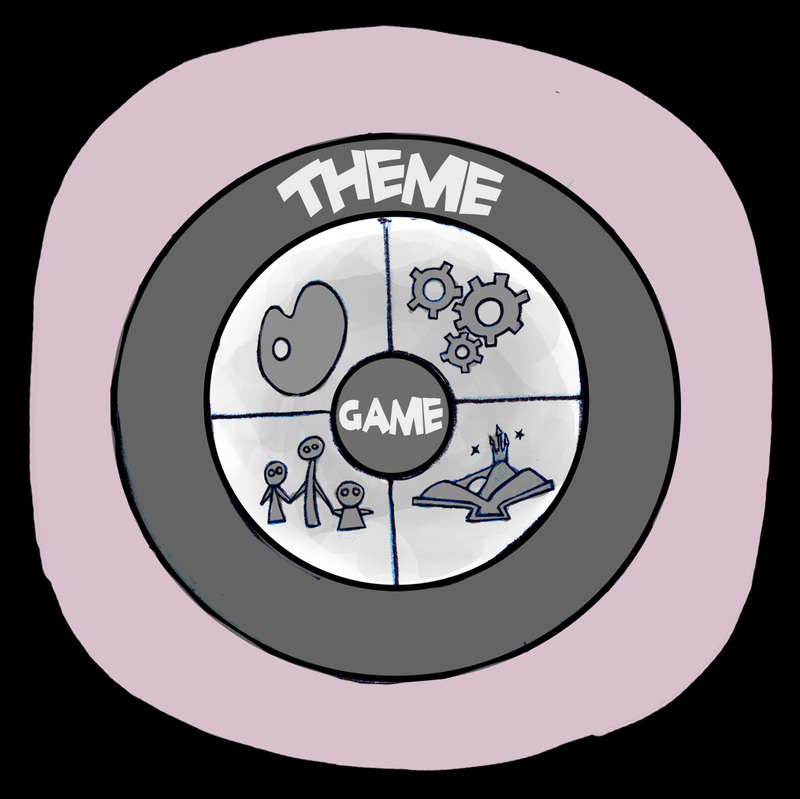 All games have a core set of activities that the player repeats over and over to advance through the game. These core repeatable activities are usually called Loops. Clarifying what is the core loop in your game and analyzing it can be very enlightening in finding out why your game works or doesn’t work. They have a set of compelling activities. 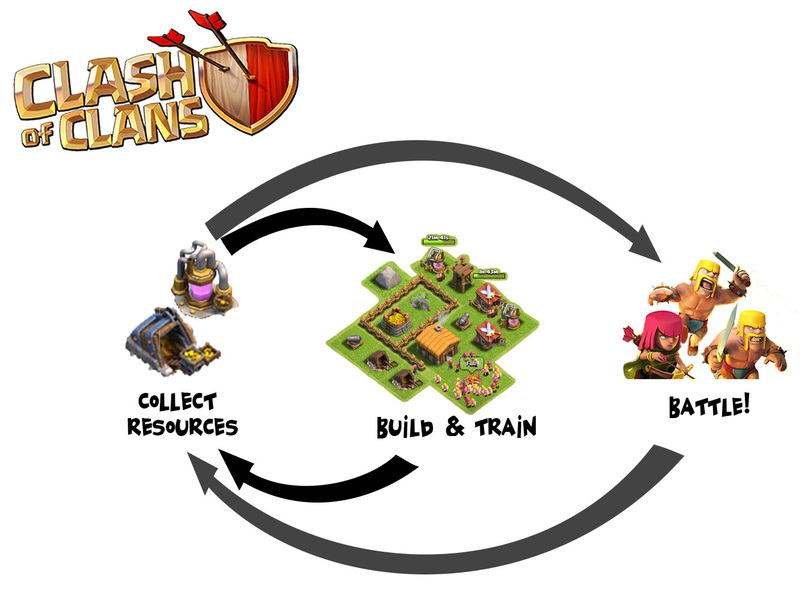 In Clash of Clans these activities are all related to building up your village and battling other villages. Those activities give you positive feedback that make the completion of activities much more satisfying. This feedback makes you feel that you are getting better at something and getting rewarded for it. In Clash of Clans, as your village grows and as you defeat other villages you get access to more resources and better troops. Built into this cycle there are triggers and incentives to keep you going back to the game. In Clash of Clans all the building up, collecting resources, and troop training takes time, so there is an incentive to keep coming back to reap the benefits of what you have already done. Also, as you put more time into developing and customizing your village and improving your troops, you feel more invested in the experience, which makes you want to go back again. Are the activities in your core loop compelling enough? How can you make them more compelling? Are you giving your players enough positive feedback about the activities they completed? Do they feel they are progressing and mastering a new skill? How can you amplify that positive feedback? Does your loop have triggers that pull players back into the game? As they go through the loop, do players feel more invested in the game? Can something be added to lure players back? Can something be added to make players feel more invested? If you want to go a little deeper on how these 3 rules work in different loops, take a look Amy Jo Kim’s article here. Question 2: Is Your Core Loop Tightly Connected to Your Goals? Connecting your core activity loop tightly to your goals is key to making a successful game. There are many for profit free-to-play games that don’t sell enough items to even be sustainable, and many educational games that are not very good at teaching what they were suppose to teach. Some are even fun, using proven fun mechanics copied from other successful games, but unsuccessful at connecting those mechanics to their goals in any meaningful way. If you are trying to sell items, those items should enhance your core loop experience. A successful example of connecting your loop to your goals is Pokemon Go. In Pokemon Go your beginner core activities are basically three: 1) walking around searching for Pokemon; 2) catching the Pokemon you find by throwing PokeBalls at them; and 3) walking to PokeStops to get more PokeBalls and other items that will make it easier to catch Pokemons. At first you have enough PokeBalls and catching Pokemons is very easy, but as you level up you will find higher level and harder to catch Pokemons that will need many more PokeBalls to be catched, so you will easily run out of PokeBalls. You can always walk to a PokeStop and get more PokeBalls, but since you are already somewhat invested, spending $1 to get extra PokeBalls doesn’t sound bad. You could keep playing for free by continue walking around to different PokeStops, but by spending $1 here and there you can make your play much more convenient and increase your chances of catching rare Pokemon faster. The items that you can buy directly make your core loop easier, so even if the game does not force you to buy anything, many players end up spending a few dollars here and there to improve their experience. In the case of an educational game, that set of core activities should produce learning. In her article Why Games Don’t Teach, Ruth Colvin Clarke talks about some examples where the game activities do not align with the educational objectives, which makes the games very ineffective. She presents some experimental evidence that concludes that narrative educational games lead to poorer learning and take longer to complete than simply displaying the lesson contents in a slide presentation. One of the games she tested is a game called Cache 17, an adventure game designed to teach how electromagnetic devices work. The problem with this game and the other games she mentions in her study is that the games’ core loops are only vaguely related to the topics they are supposed to teach. In the case of Cache 17, the players need to solve a mystery about some missing paintings that disappeared during World War II by searching through an underground bunker. The link to the topic is that players occasionally need to build an electromechanical device to open some doors and vaults in the bunker. The core loop is about exploring a bunker and finding clues, not about experimenting with electromechanical devices. Not surprisingly, the study found that reading a slide about electromagnetic principles was quicker and much more effective at teaching the topic than playing the game. When the educational objectives are more aligned to the core loop the results are very different. Using a resource strategy game like Sid Meier’s Civilization as a supporting tool to teach the relationships between military, technological, political, and socioeconomic development has been so successful for educators, that a purely educational version of the game was announced for 2017. Here, the core loop is closely aligned to the educational objectives. Your core play is all about figuring out the right combinations economic development, exploration, government, diplomacy, and military conquest to create a successful civilization. Question 3: Is Your Core Loop Connected to All the Ingredients of an Engaging Experience? 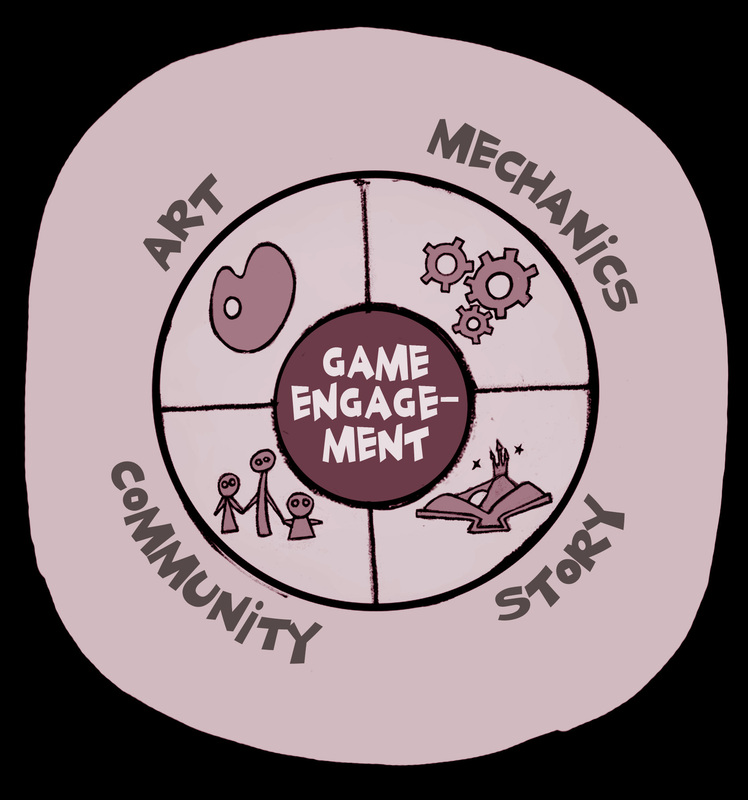 As I’ve mentioned in a previous article, the ingredients of engagement go beyond game mechanics; they include other things like art, theme, story, and community building. When you are able to connect your loop to these other ingredients the engagement is much more powerful. In Toontown Online for example -a game developed by Disney in which the overall goal was to defend a cartoony world from invading business robots- we wanted to make sure that the core loop reinforced the overall Theme of the game. This Theme was something like: “Work is always trying to take over our play time, but play most prevail” so we included as an essential part of the core loop to stop the robot invasion the need to play. Without playing arcade-like minigames you could not earn jelly beans, the main currency that was essential to buy gags that would help you stop the business robot invasion. So even when the story and main conflict was about defending Toontown and battling business robots, you couldn’t do it without playing and having care-free fun. The result was a core game loop that reinforced the Theme of the game, the conflict between work and play, and because the Theme resonated with many players beyond our original target -kids between 6 and 12- the game ended up being very popular with players well beyond our target demographic. Also, as you repeated the loop, the game prompted you to explore other parts of the world, team up with other players and make friends, and unfold new stories. In other words it pushed you to discover new art and stories, build community, and master the mechanics, which made the game much more engaging. The result was an average player lifespan much higher than most other family oriented games at the time, which made the game very profitable for over 10 years. 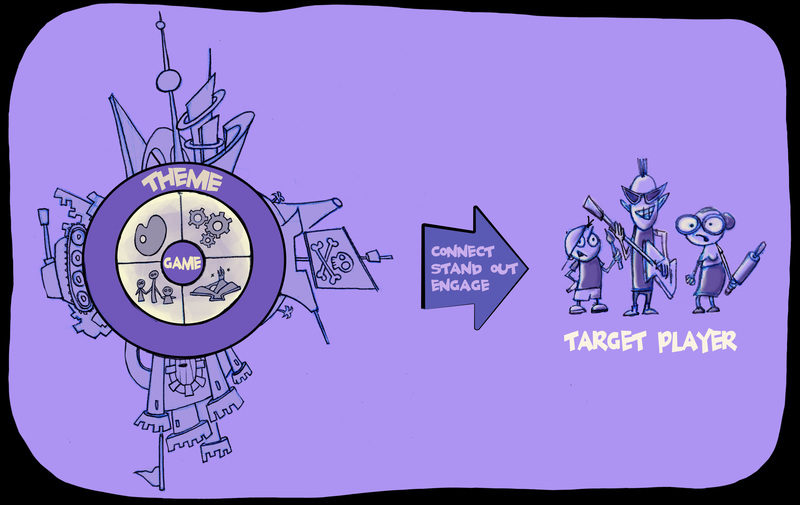 The more you are able to connect your core loop of activities to the ingredients that make a game engaging, the stronger and longer engagement you will have. Are the activities in your loop compelling enough? Do you provide enough positive feedback when players complete the activities? As players complete a loop do they get something that makes them feel invested? Is the loop directly linked to your objectives? If you are selling something, does that make the loop more satisfying? If you are teaching something are the core activities directly linked to the topics the player needs to learn? Does your loop reinforce the different ingredients of an engaging experience? As players go through the loop, can you provide more things to discover and get mesmerized by? Can you add more interesting pieces of a story? Can you guide the player into forming a tighter community? Do these questions trigger for you new ideas on how to improve the game you are working on? Please let me know in the comments. Welcome to The Anatomy of a Successful Game! 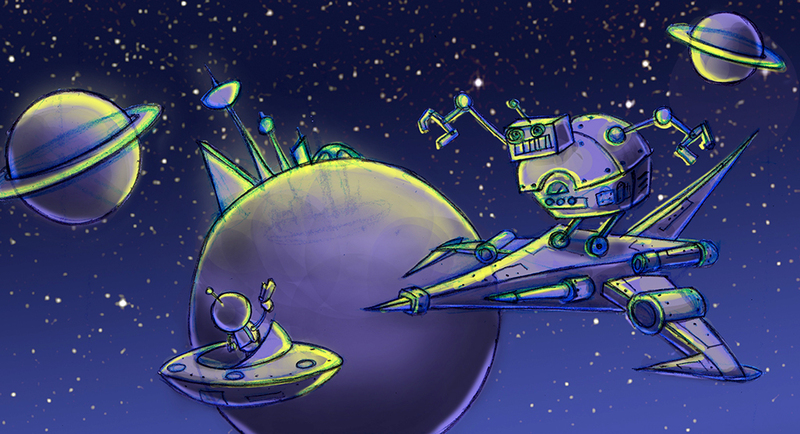 We all want to make successful games: innovative, loved by players, and profitable. But if you have been around game development for a while, you know this is hard to do. There are a lot of risks and pitfalls along the way. The goal of this blog is to help you figure out the ingredients and processes that can help you make better and more successful games.